This Anglo/Australian duo has been described as “quite simply the most refreshing, impressive and compelling combo” around. They have returned to Australia for a few months, performing at Woodford and Cygnet Folk Festivals and touring New Zealand in January/February. At Almost Acoustic on Saturday 18th February, we’ll have the pleasure of hosting their first Sydney concert for the year. And in 2006 Nancy and James celebrate their tenth anniversary together. 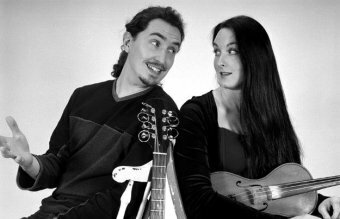 Winners of the BBC Radio 2 Folk Award for Best Duo 2003, and the BBC Horizon Award in 2000, the couple goes from strength to strength. In live performance “the telepathic and sympathetic interplay of Kerr and Fagan never fails to amaze” and they have a magic quality on stage – evident at the recent Woodford Folk Festival where they received a standing ovation at one event. Nancy and James have just released Strands of Gold, their fourth CD. The package is minimalist and classy – matching the contents of the CD itself where Nancy and James are joined skilfully and discreetly by some excellent musicians. The level of vocal and instrumental excellence is quite astounding and their arrangements range from delicate to exuberant, captivating and involving the listener in the celebration of their music. Lyrebird is the name for duo, Kate Henshaw (vocals, blues harp, glockenspiel, keyboard, accordion and recorders.) and Pete Doherty (guitars, blues harps and vocals). 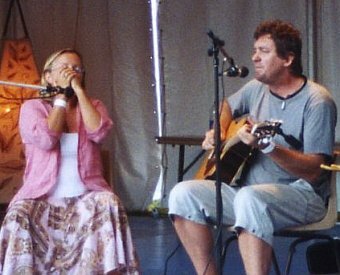 They share the singing, and describe their music as a mix of trad Celtic, pop and country with blues and jazz overtones. Beautiful harmonies, catchy tunes and quality lyrics accompany their songs. While the two are relatively new to the Sydney folk scene; you only have to hear them play a bar or two before it is apparent that these are highly competent musicians, their presentation signifying decades of experience in a variety of genres. Pete has had twenty years of live performance in rock, blues and roots bands and he’s a noted session guitarist. His lyrical acoustic riffs work beautifully in the duo. Pete is the owner of Goose Recording Studios in Leichhardt, Sydney, where he produces albums for independent bands. Kate is lead vocalist with Zephyr - a classical crossover group signed to Origin Records. With a pure and powerful soprano voice, Kate has sung in concert halls and inner city pubs and successfully crosses the classical and roots genres. On blues harp, she can belt out riffs Sonny Terry would be proud of. A piano player noted for real and rootsy emotion, Kate is often called upon to lend edge to roots recordings in hometown Sydney. Doors open 8pm. Music from 8.30pm. The venue is licensed and substantial finger food and snacks are available. No BYO please. Free car parking – Gordon Street Church car park. Good public transport. Almost Acoustic is supported by the Folk Federation of NSW, Eastside Arts, and the NSW Ministry for the Arts.